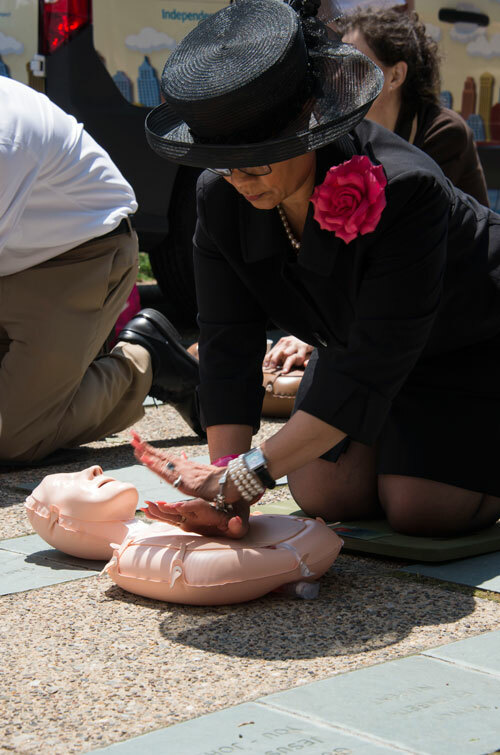 Philadelphia, PA— June 7, 2016 – The Philadelphia Regional CPR Awareness Coalition (“the Coalition”) today launched CPR Ready, a campaign designed to increase the number of people in the region who are qualified and willing to perform bystander Hands-Only CPR, as well as use an automated external defibrillator (AED). The CPR Ready campaign kicked off today with a half-day, educational event at WHYY studios in Philadelphia which included on-site Hands-Only CPR Training, survivor and rescuer stories, and informative panel discussions. Participants learned that hands-only CPR does not require mouth-to-mouth breaths and an AED can help restore an abnormal heart rhythm. June 1-7 is National CPR and AED Awareness Week. The CPR Ready campaign responds to alarmingly low public awareness of how to react during a sudden cardiac arrest. Studies show that 70 percent of Americans feel helpless to act during a cardiac emergency because they don’t know how to properly administer CPR or they’re afraid of hurting the victim. The problem is particularly acute in Philadelphia, where more than 1,100 people died of cardiac arrest within the past year. The percentage of people in Philadelphia who received bystander CPR in 2015 was half the national average (40.6 percent nationally vs. 20.3 percent in Philadelphia). The Coalition, which started earlier this year, currently includes the American Heart Association, American Red Cross, The Children’s Hospital of Philadelphia, CPR/AED Public Awareness and Training Network, The Health Care Improvement Foundation, Independence Blue Cross, Independence Blue Cross Foundation, Penn Medicine, Philadelphia Fire Department, and the School District of Philadelphia. 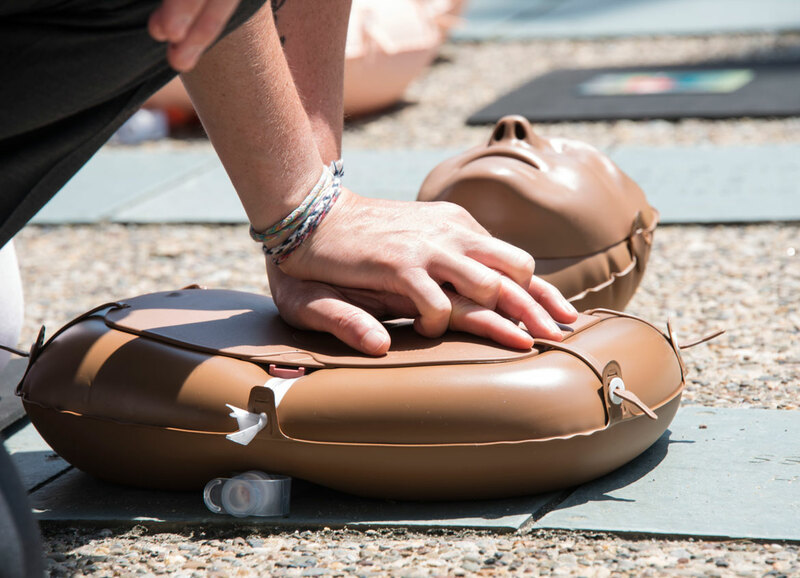 The group aims to have CPR/AED training taught in at least half of the middle and high schools within the next three years – with a long-term goal of reaching all middle and high schools in southeastern Pennsylvania. The Coalition also aspires to triple overall CPR training in Greater Philadelphia and double the number of people who provide CPR after witnessing a cardiac arrest. Also at today’s event, Penn Medicine launched its new Mobile CPR Project which seeks to eliminate cost and logistical barriers by making CPR training more accessible to underserved communities. Made possible by a grant from the Independence Blue Cross Foundation, the Mobile CPR Project brings free training to community centers, public libraries, faith organizations, shelters, and other locations. Training will be conducted several times a week using American Heart Association video self-instruction kits and is available in English and Spanish. Visit the American Red Cross Hands-Only CPR or American Heart Association CPR and First Aid for information about training. The Philadelphia Regional CPR Awareness Coalition is a regional initiative dedicated to improving the outcomes of individuals sustaining out-of-hospital cardiac arrest by increasing the number of people in the Philadelphia region who are knowledgeable and willing to perform bystander Hands-Only cardiopulmonary resuscitation (CPR) and are capable of using an automated external defibrillator (AED). Currently, the coalition is comprised of representatives from the American Heart Association, American Red Cross, The Children’s Hospital of Philadelphia, The CPR/AED Public Awareness and Training Network, The Health Care Improvement Foundation, Independence Blue Cross, Independence Blue Cross Foundation, Penn Medicine, Philadelphia Fire Department, and the School District of Philadelphia. Independence Blue Cross is the leading health insurance organization in southeastern Pennsylvania. With our affiliates, we serve nearly 9 million people in 32 states and the District of Columbia, including 2.5 million in the region. For nearly 80 years, we have been enhancing the health and wellness of the people and communities we serve by delivering innovative and competitively priced health care products and services; pioneering new ways to reward doctors, hospitals, and other health care professionals for coordinated, quality care; and supporting programs and events that promote wellness. To learn more, visit www.ibx.com. Connect with us on Facebook at ibx.com/facebook and on Twitter at @ibx. Independence Blue Cross is an independent licensee of the Blue Cross and Blue Shield Association.